Did you notice that the First Edition Designer Series paper is all about the news? 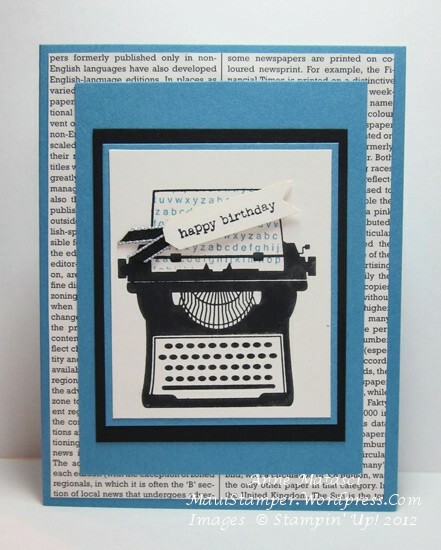 And did you see my little bit of black “typewriter ribbon”??? I KNOW. Keeping a card interesting when there is just a single image can be challenging. I usually do one of two things – lots and lots of layers, or no layers whatsoever. In this case, it’s lots of layers (brilliant, huh? – I’m a rocket surgeon in my spare time!) I did have to fight the temptation to add buttons and brads and all of that. I’m still on my “gotta be able to mail it” kick. Don’t know how much longer that’s gonna last, because my fingers are gettin’ twitchy for some big bling. I’m trying to keep a minimalist attitude these days. Spring break is coming, and we’ve got a trip planned. Mr. Maui Stamper has decided that we should carry on luggage – for a 9 day trip. You know, travel light. I feel like the Little Engine that Could – I think I can, I think I can, I think I can. I think I have the clothing thing down – black is a wonderful color, and with temperatures in the 50’s, it will be layers, layers, layers! I have the shoe thing down – I’m a comfort-before-beauty kind of girl when it comes to shoes. The problem is that dog-gone quart ziploc bag. All of my girl-stuff is NOT going to fit, and I NEED my shampoo, and conditioner, and lotions and magical potions! I may have to leave the “Hair-be-tame” potion behind, which means I will have hair like nobody’s business – GINORMOUS. There may or may not be a photographic record of this trip, at least as far as my presence is concerned. Stay tuned.